Oh boy Oh boy…I done got myself into a fine pickle! We stopped by the St Luke today and WOW those pictures were mighty old I received. This poor ol property looks like one strong gust will tumble it over! I made a photo album with all sorts of close up pictures of the outside and property. I am attempting to add photos to my posts but stupid firefox is acting up again. I just need a mac every time I hit delete or type one letter it goes “not responding”. I am trying to fix it as it is annoying to have to type on Word and transfer it over. Still working on if it is original but this be a Cin. 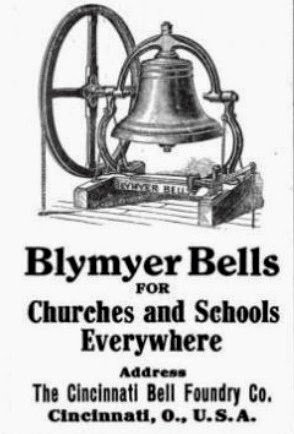 Bell Co. bell aka Blymyer Iron Works. It looks like it may weigh say 900lbs. I just joined this site below and I hope that they would be able to help in the restoration. I suppose, I first must confirm the odd feelings that I have been getting for this property. I literally want to go to the hardware store tomorrow and buy items to secure the property. It appears that one thing just leads to another and it just keeps going. I am finding I just need to wait and just let things come as they do. After we looked at the property we decided to wonder around downtown. I was hoping that maybe we could find a cool junk shop and possible meet someone who would know something about the property. We decided to park by the Museum/Historical society even though it wasn’t open till April 1st I was hoping to peek inside the windows. We then went walking downtown and I seen the newspaper office. I thought if anyone would know about the property they would. It turned out that they had no idea about the property and in fact most didn’t know there was a church there I thought it was odd for a small town. Where oh where did those original church windows end up?? First thing I noticed besides vinyl wrapping was dual pane windows. Yes they were expensive but they didn't have those 160 years ago. So where are these windows? Why is this them? Appears a basement was dug out and the original windows ended up in the basement walls!! 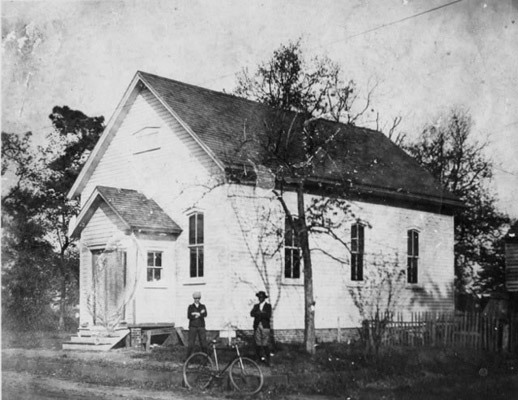 Here is a great photo of a Baptist church that had these style of windows installed, this is circa 1900. It shows what this place can look like again! I wonder if there was a covered entry like this originally. Love this feature too!! It has a well!!!! I hope its not dry, we would have the water tested on a certain schedule and we would have amazing fresh ground water for both gardens and us!! After the stop by City Hall we started walking back to the car and we noticed another car pull behind ours and I thought it was odd as the historical society was closed. As we got to our car I noticed a women walk out and into the building. I then seen her inside so I knocked and asked if they knew anything about the church. She said they didn’t have anything on this church but they had a lot of stuff on the newer churches in town well new as in 1900’s. She stated that since the dwindling congregations are happening that African American churches are becoming very rare as they are moving into larger congregations in larger cities. I told her this is one of the reasons I want to save this property as they are becoming quite rare. The era that surround this church is long being forgotten and it shouldn’t be forgotten. There is way too much history in this property to see it just return to mother earth. Is that 7 layers of roofing? Its great, because it shows me that originally it had a shake roof, boy will that look nice redone!! So I called the pastor and was welcomed with amazing positive energy. She was the pastor of that church until it closed from years 1997-2002. This was great she was so happy to hear someone had an interest in the property and wanted to save it. I gave her a brief run down on why we wanted it and what we hoped to achieve. It was a great phone call and it told me that the property was sitting since 2003. Her name is Eraina Aseme and she has a Dr. in front of that. I hope to be able to sit down with her and get a ton of the history of the church as she has. She then lead me to Presiding Elder Donna F. Roberson which I left a voicemail for. Sad the only tree on the property and it may need to be taken down :( My plan would be to buy a very long drill bit to see how far the tree is rotted and then limb it down. I can then do a old trick and fill the rotted center with cement to keep it from further rotting and toppling over. I hope that swing branch is still solid! We are now in Carrollton relaxing well trying to it sounds as though there is a WWF fight going on next door. Now I can just sit down and tell whomever is wanting this to happen that we followed their word/feeling/push whatever you want to call it. And that I will try everything in my power to obtain the property rather we own it straight out or figure out some sort of lease. As the way I see it I do not want to profit off this property and I do not want to modernize it in any way to attract from its history. The fact is when I am gone I want the property to go into the hands of someone like me and hopeful its history will last another 160 years. This will be a very very expensive and not so easy timber to replace "but" you can see the original flooring of the church. The porch on the rear is amazingly like brand new, I was worried it would slowly pull away from the building as I was standing on it. I keep stating to the universe that in just one week we can make this property look 100% different by just by doing some maintenance and removal of modern failing apart blight. Good thing the porch isn't original not much to save. PLEASE be sitting down when you look at the photos! You will see holes in the roof, failing foundation and well everything in-between BUT I found the Kitchen sink! !